Time to say goodbye to Dell's old MacBook Air rival. 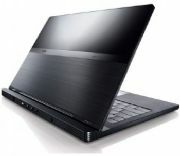 The Dell Adamo, introduced in 2009 and positioned as a Windows alternative to Apple's ultrathin laptop, will be discontinued once Dell sells its remaining inventory, unnamed sources told CNet. The Adamo is already gone from Dell's website (except for refurbished models), but other retailers such as Amazon are still selling the laptop. Dell's discontinuation of the Adamo is no surprise. By 2009's standards, the laptops were overpriced, at $2,000 for the basic model, and underpowered, with a weak battery and a 1.4 GHz Core 2 Duo processor. While Dell has slashed prices over time -- a holiday deal brought the cost down to $799 -- the specs haven't improved. Meanwhile, Apple has refreshed its own MacBook Air line with a much thinner design thanks to specially designed solid state drives, tapering up to 0.68 inches thick. The new Airs are also cheaper, starting at $999 for an 11-inch model. The door is open for a new wave of MacBook Air rivals with Toshiba's slim solid state drives -- reportedly the same kind that Apple uses -- and at least one PC vendor is already committed to battling the MacBook Air for ultrathin supremacy. At CES, Samsung showed off the 9 Series, a 13.3-inch laptop measuring 0.64 inches thick with a 128 GB solid state drive, 6.5 hours of battery life and Intel's new Sandy Bridge CPU platform. The 9 Series will be available in the spring for $1,599. Faced with these developments, Dell can either overhaul its own Adamo line or back out of the ultrathin computing game altogether. According to CNet, Dell will introduce an entirely new ultrathin design within six months, but the products will simply be integrated into Dell's existing consumer laptop lines such as XPS and Inspiron. The meaning of "Adamo" was always a mystery anyway.